One of the first courses I took for my Interior Design degree, was a course on sustainable designs, and all the ways you can incorporate sustainability into your practice. This class was actually such an eye-opener for me that I temporarily shifted my major over to Environmental Science-but that’s a story for another day. My biggest takeaway, is just how wasteful this industry can be, and it doesn’t have to be!! From knock-down, drag-out demo days, seeing everything filling a dumpster; to single use, mass produced tchotchkes that are made to be used for a short period of time and then disposed of, a lot of our industry has a short and fast life cycle that results in dumpsters and landfills. But it doesn’t all have to be thrown out. When we are working on a renovation, we can take stock of any pieces that we may be able to reuse either in a different room or even in the same room, and note any pieces we may want to altered with reupholstery, paint, etc., to transform their look, and then use again. 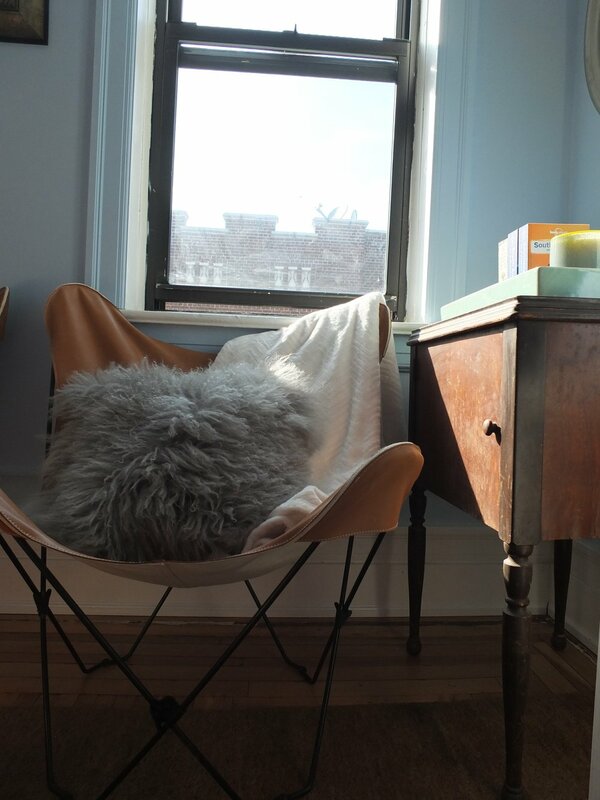 A repurposed sewing table, being used as additional storage in this family condo, and a salvaged butterfly chair frame with new cover create a cozy reading nook. 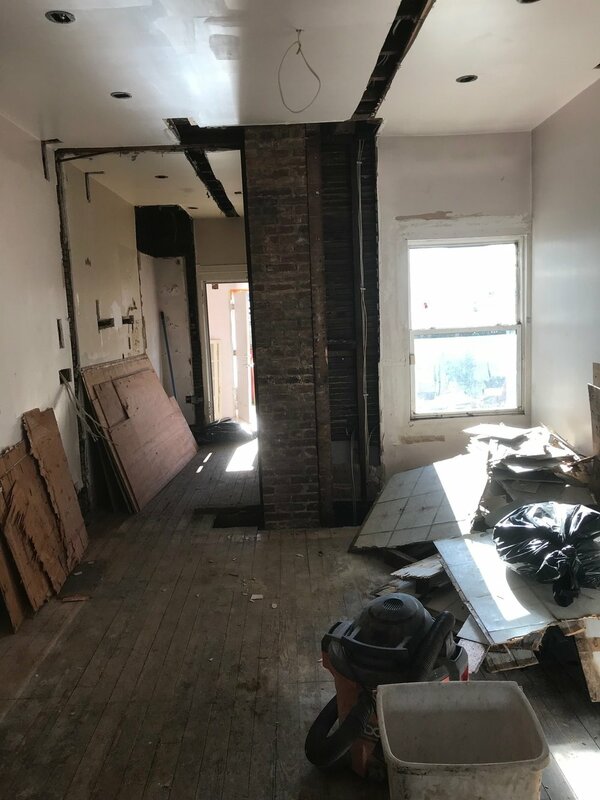 The other thing we can do to cut down on reno waste is to look over what can be salvaged prior to demo. Anything that isn’t going to be kept for the new space, but is still in decent condition can often be removed delicately to be either consigned or donated to a salvage yard, Habitat for Humanity ReUse Store, or similar in your area. This can be anything from old cabinetry, to tile, to doors! This is often just a conversation to have with your contractor. 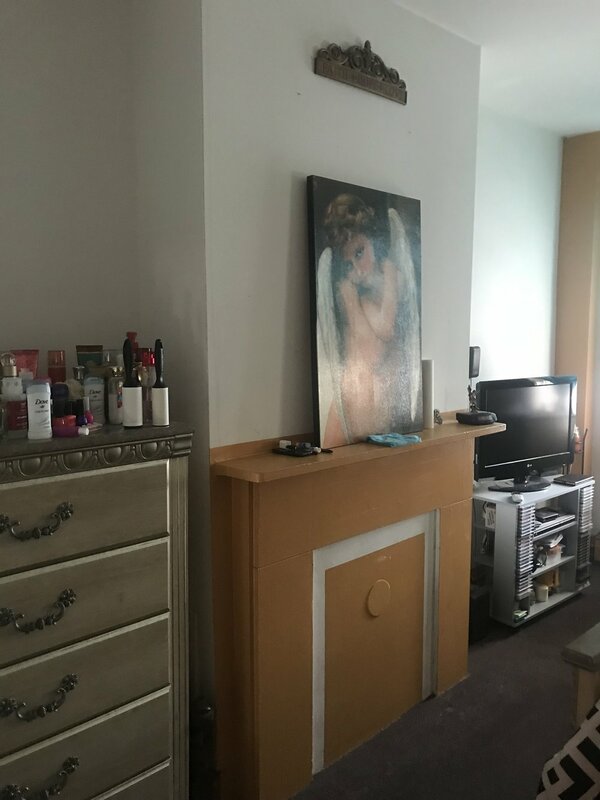 Let them know you want to salvage what you can and point out pieces in particular that you want to save to be removed with caution and stored for transport to the donation facility of your choice. A salvaged cast iron sink, getting refinished to add a playful element and bold color to this kids bath. Where is it made? Will it have a large impact getting from the manufacturer to us? How is it made? Is it made using materials and practices that will stand the test of time? What is the manufacturer’s stance on the environment? Do they have a sustainability policy in place? 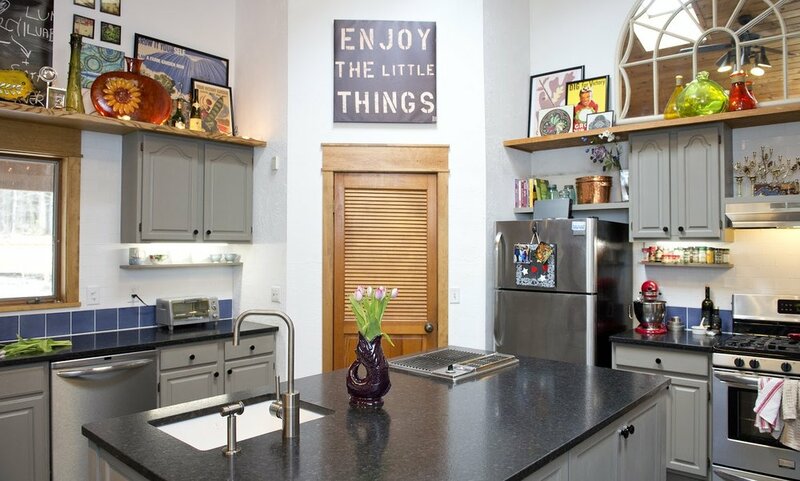 This upcycled kitchen uses a combination of all things sustainable, from updating the existing cabinetry, and salvaging the grill in the island, to bringing in high quality plumbing and tiles made from recycled materials. It’s really important to me to make sure all of these things are kept in mind, and then to execute our design by selecting pieces that will stand the test of time in your home and with your lifestyle. With better quality materials and pieces made to last, we can create a wonderful space in your home and do so with a clear conscious. Happy New Year! This year is one we are very much looking forward to! Last year was an incredible year of growth and big changes, all that made us stronger. This year will be the year we move into our new home and begin making memories, and what’s even better?! We will be helping our clients do the same with each of our projects on the horizon for 2019 and we couldn’t be more excited! 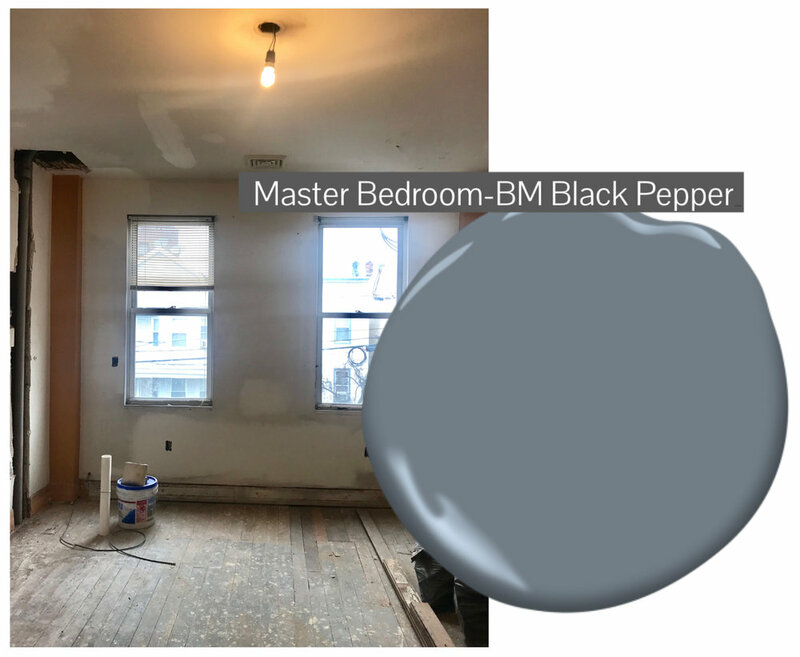 This weekend we are going to begin painting the sugar box (the name we lovingly use to refer to our Jersey City row house), and I thought I would share with you the neutral, light and colorful scheme we have put together for the home. 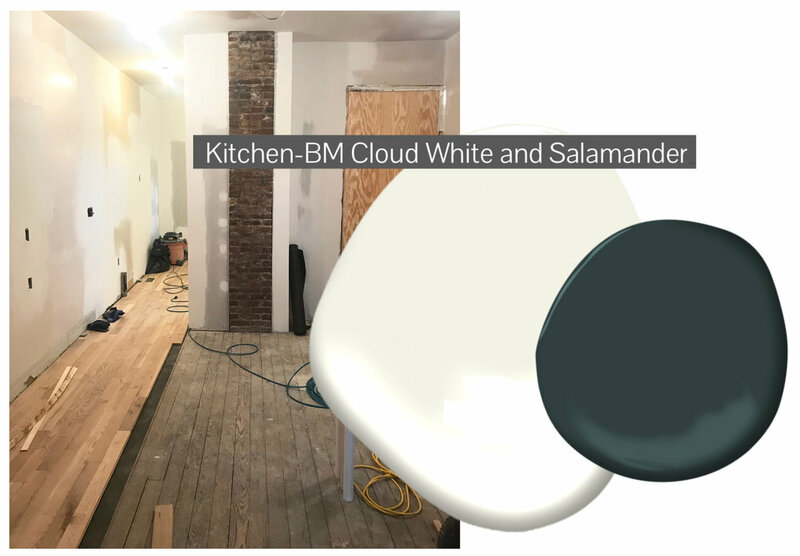 I’m really excited for this palette to get up on the walls, it has an air of playfulness, especially upstairs, so while we prepare to paint, here is a look at the space and a look at the colors. Up the stairs, the hallway splits off in both directions left to Eleanor’s room and my office/guest room; and right to the master bedroom. 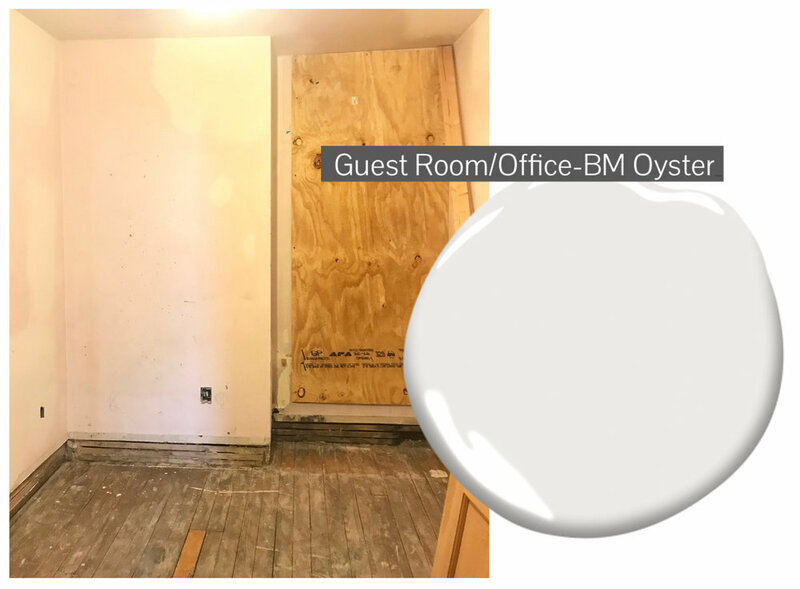 Again, if all the doorways are open you can see from our room all of the adjoining spaces off of the hallway, but additionally up here, we wanted to let the rooms be a little more personal through their colors. Eleanor chose the color for hers, and even though she is only 2 when she looked at the options (about 20 colors in front of her) she consistently chose the same color every time… so that’s what we are going with. Our master bedroom color was the same and Pat and I just landed on it time and again, so we knew that was the right choice. For my office though, I had a harder time. I knew I wanted it to feel like a color, but I also wanted it to be grounding, peaceful and neutral enough not to distort any samples I may be working with in the space. We did find a really pretty color and I’ll say, Pat actually found it’s sister color and I chose a shade lighter to get it to where I envisioned it for the space. Here are the colors again altogether and I’m really pleased with how they flow. 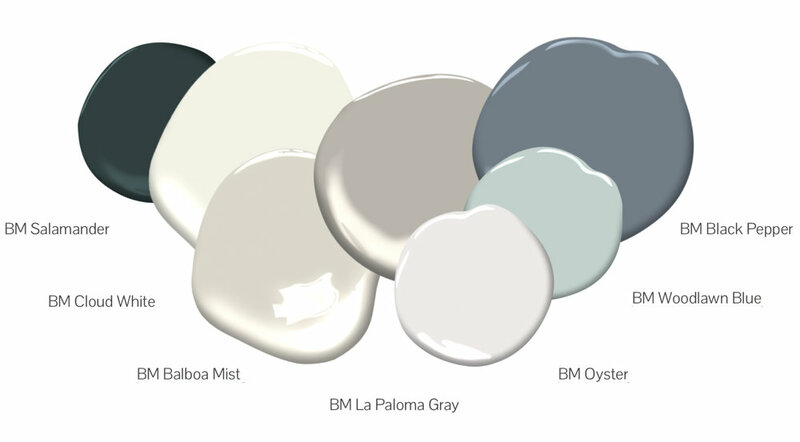 They are as follows, left to right (all Benjamin Moore): Kitchen Cabinets (Salamander), Kitchen and Family Room Walls (Cloud White), Living Room Walls (Balboa Mist), Stairway and Halls (La Paloma Gray), Office/Guest Room (Oyster), Eleanor’s Room (Woodlawn Blue), Master Bedroom (Black Pepper). 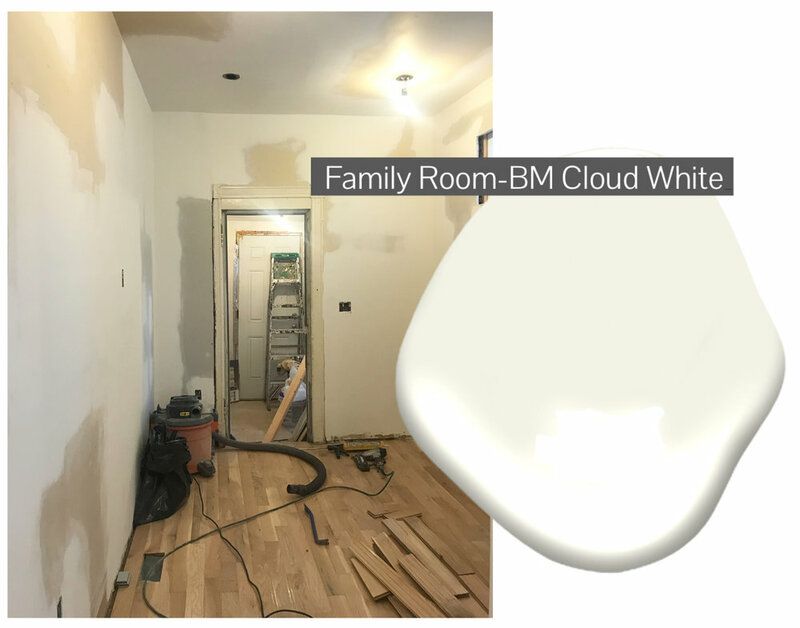 Other paint and finish details for our modern color scheme in an old house…We are going to paint any remaining trim work cloud white and then as we work through the rooms upgrading the moldings that may change. 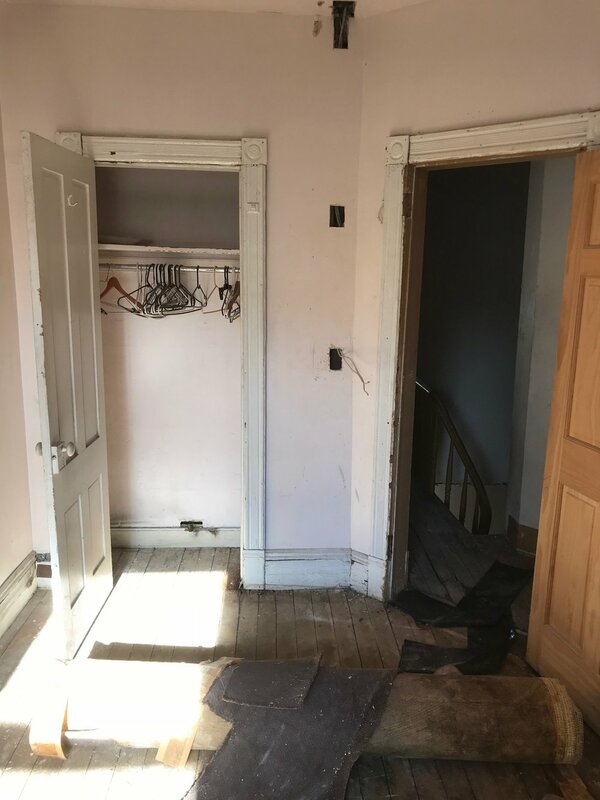 For the doors facing the hallway, I am envisioning them being stripped and wood tone but on the interior side of the room I imagine they will be white or the trim color. 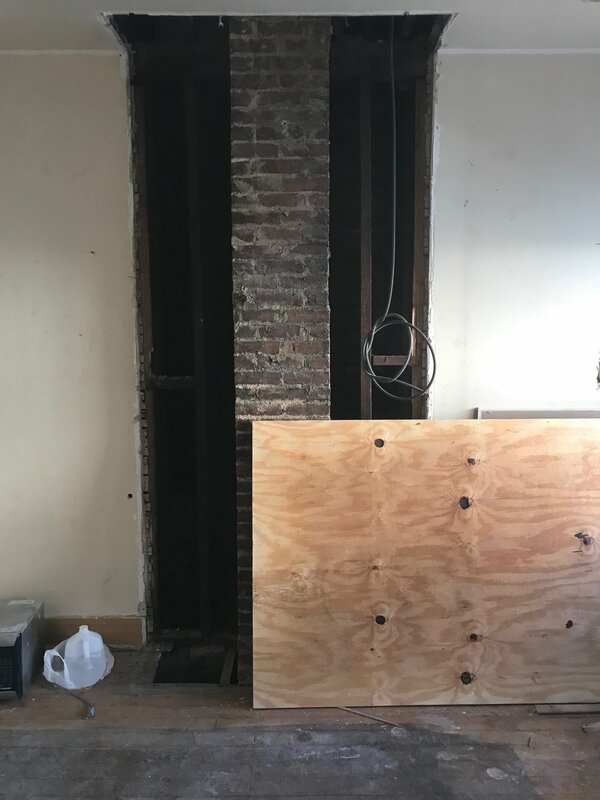 The powder room and basement door (the only interior doors on the first floor right now) will likely also be stripped down to wood and those can be wood on both sides. 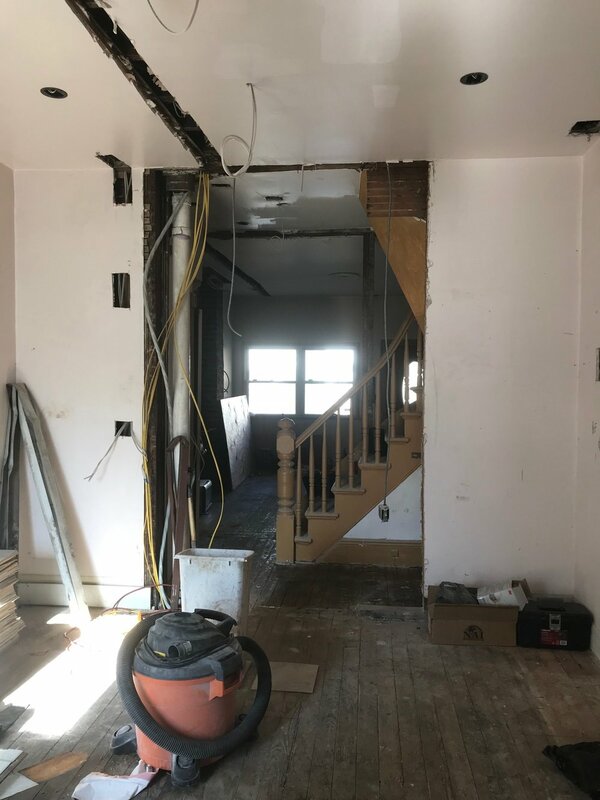 With the whole house we are trying to balance the character and charm of the original house (built in 1896), while also updating everything to work with our more warm modern style. 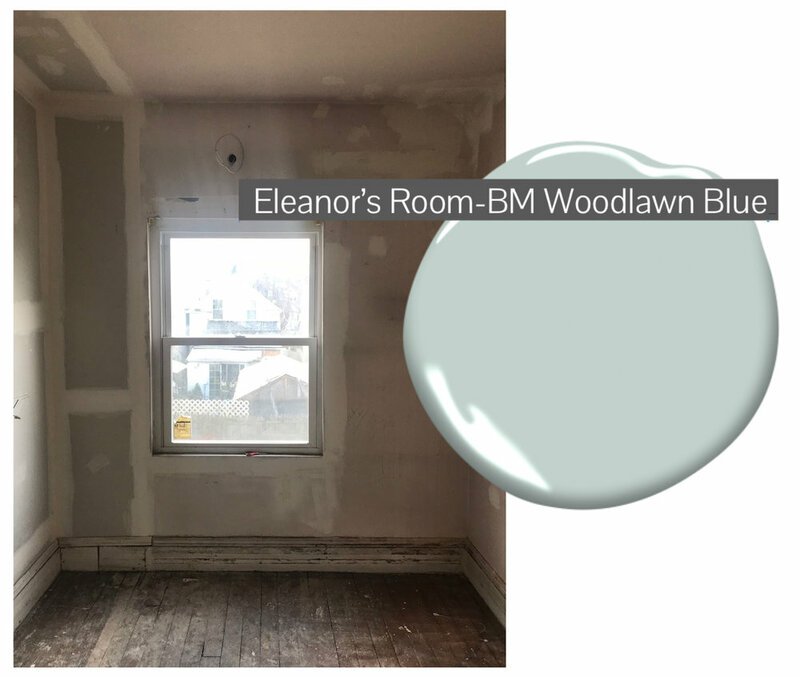 I think this color palette keeps things warm and harmonious throughout the space, and details like moldings and the wooden doors echo back to the original house and the history there. What do you think of our updated color scheme? 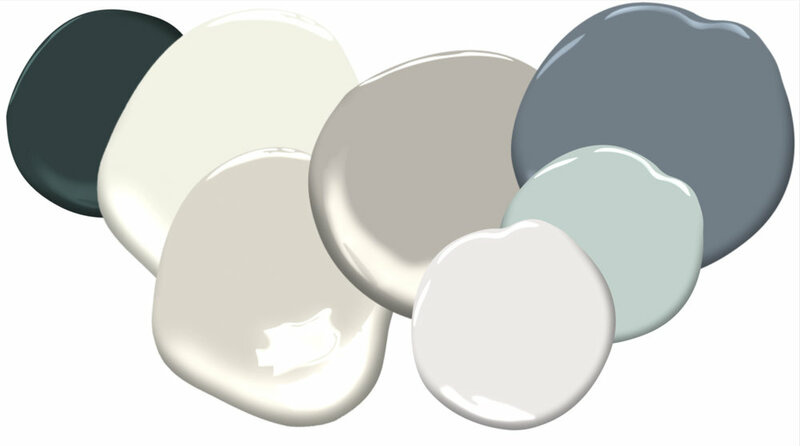 Would you use any or all of these colors in your home? 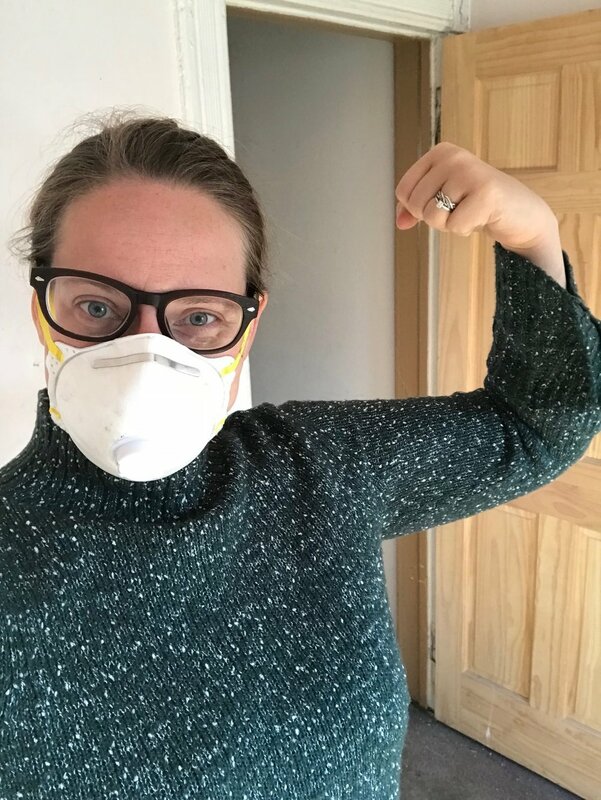 I can’t wait to share updated photos of the house and the progress in the next week or so…be sure to follow along on Instagram Stories for updates while we are painting over the weekend and I will try to share some of the details to Facebook as well! Project AND is a whole home renovation that is touching every room in the house of a really sweet couple. 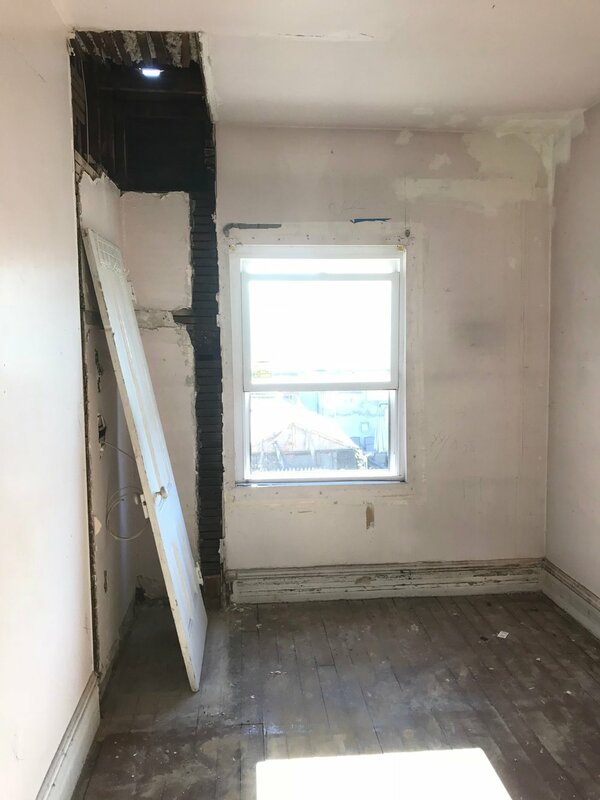 The house was purchased from family, and after 5 years of living in a home they never really loved aesthetically, they have made the decision to get rid of the popcorn ceilings and really make it their own. I’m so excited to be the one who gets to help them on this journey, and I love their fun sense of style. They are willing to take some risks design wise, and make selections they love, but they do want to keep resale in mind, so in some areas we are taming it down and in others, we are really making our mark. Our primary focuses for the project are the kitchen, dining room and hall bath. 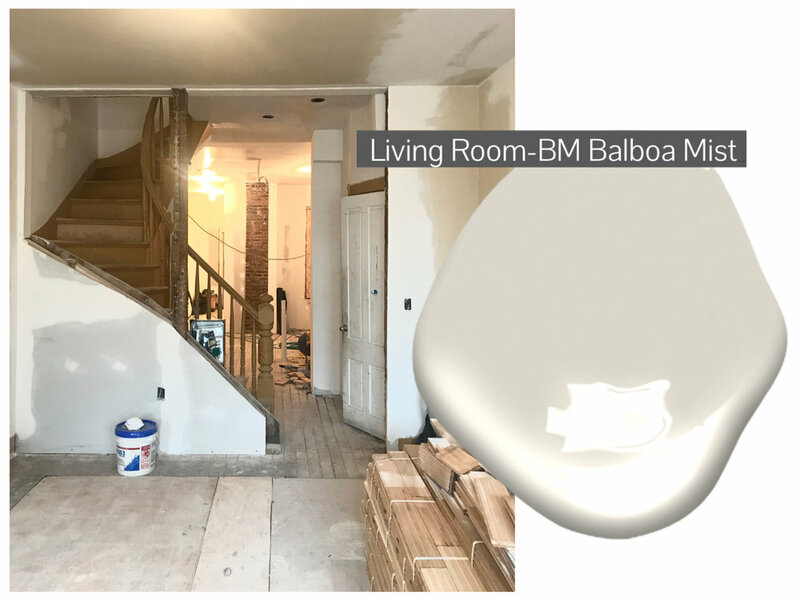 We are also fully making over the entryway, the guest room, and the master bedroom, and then the living room and office are getting facelifts through updated floors, paint and lighting. 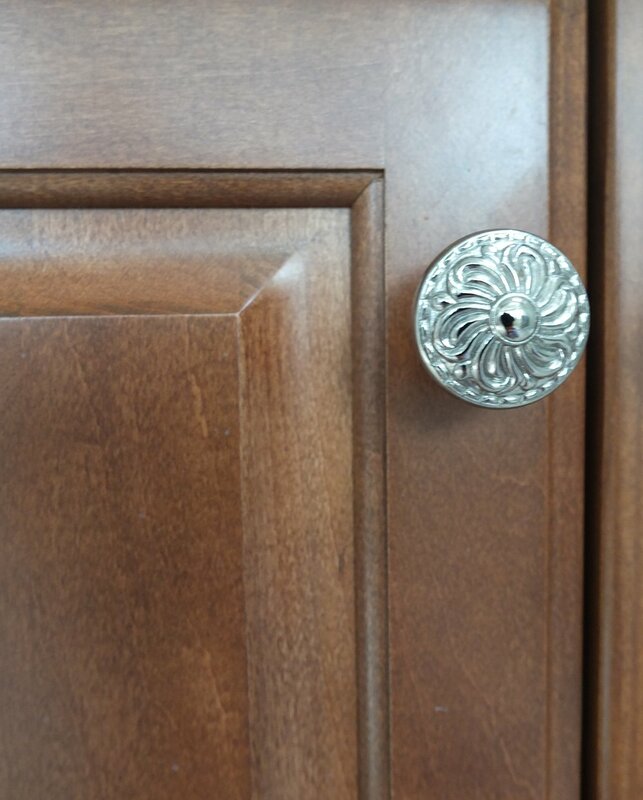 Light, Faucet, Cabinet knobs and pulls; Counters, tile and cabinetry all ordered locally. Lights, Mirrors, Faucets, Cabinet knobs; Counters, tile, cabinetry, etc., ordered locally. 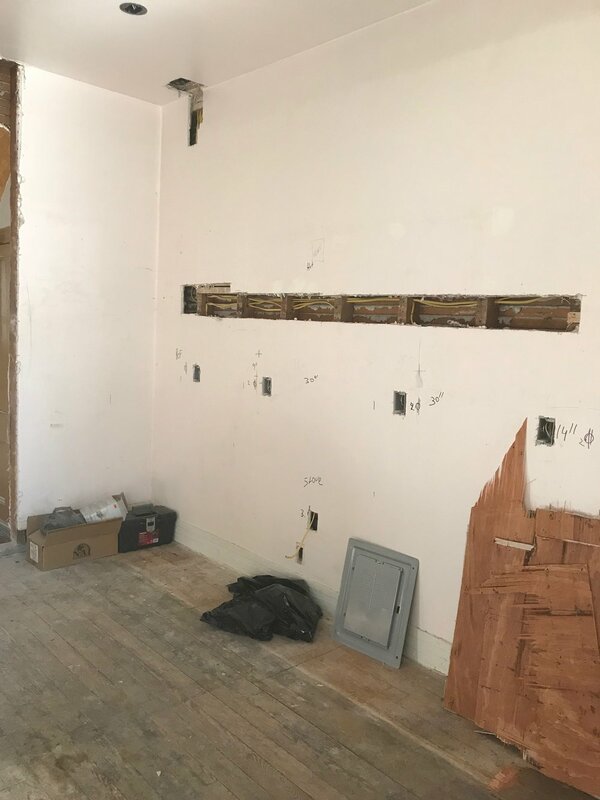 The current status of this project is that the last few materials have been delivered and they will be installing all of the cabinetry, tile and appliances soon. That is quickly followed by counters and then all of the pretty little details! I can’t wait to get back on site to check in and I’ll share more of the design details for the rest of the spaces as it starts coming together. You can always follow progress on our social media using the project hashtag (#dbkprojectAND). Feedback is my favorite, feel free to leave a comment here to let us know what you think! 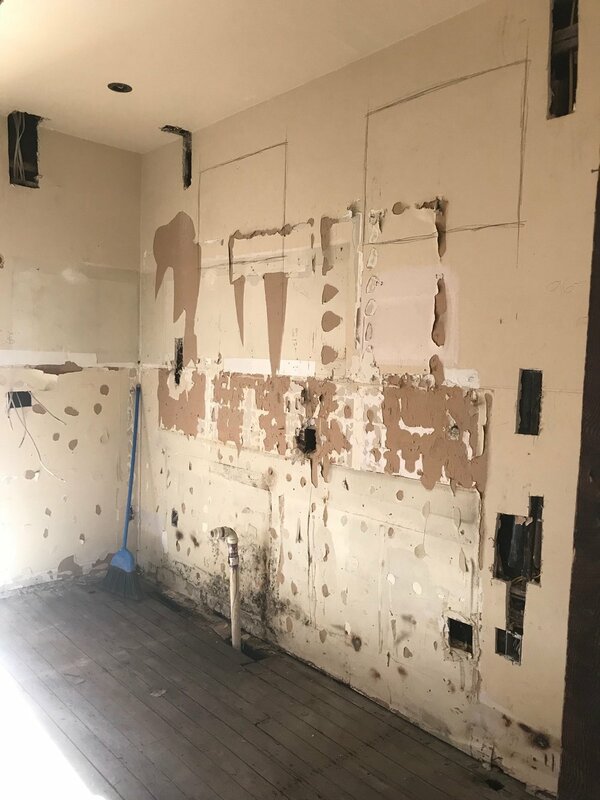 All of the walls have been opened up wherever they could be, the old horrible floors are out and we’ve done as much electrical and plumbing as we can do. We are ready for inspections! While we wait, I’ve been wrestling with design decisions, making some final tweaks here and there to my mood board and working on sourcing all the finishing products. I’ve met with the floor guy and have a meeting this week to meet with the stair railing guy, and talked to all the other guys (there are a lot of men in this industry) so we are rounding in on having everything set (more or less), and I thought I would take you on a little demo tour. If you want to see what the house looked like when we bought it, you can hop back a few posts to see it here. It’s already come a long way. Living Room: Fortunately in the living room, everything has pretty much gone as expected. The wall between the stairs and the living room had to be supported along the width of the room, but I don’t mind that small post there so far. The major surprise was finding out we couldn’t just refinish the floors on the first floor. 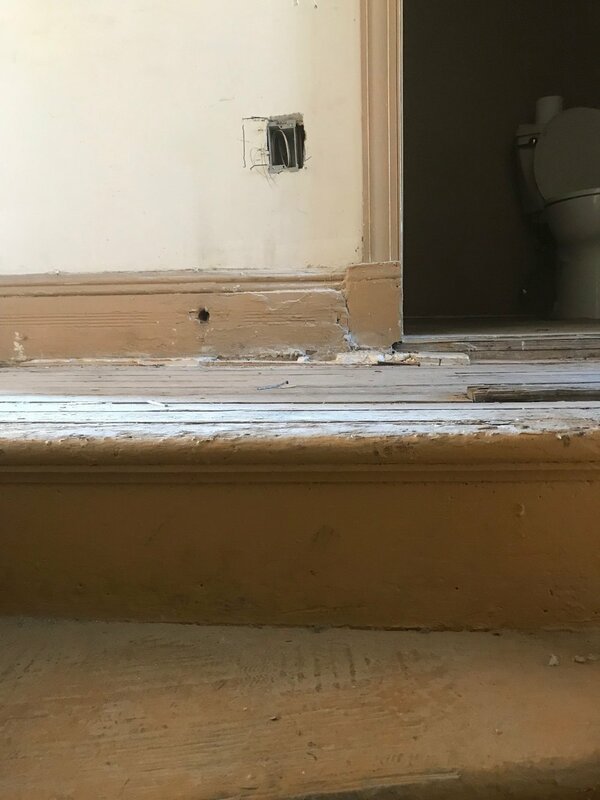 Due to the way the house was built back in the 1890’s there was no subfloor and the floors themselves were starting to wear. 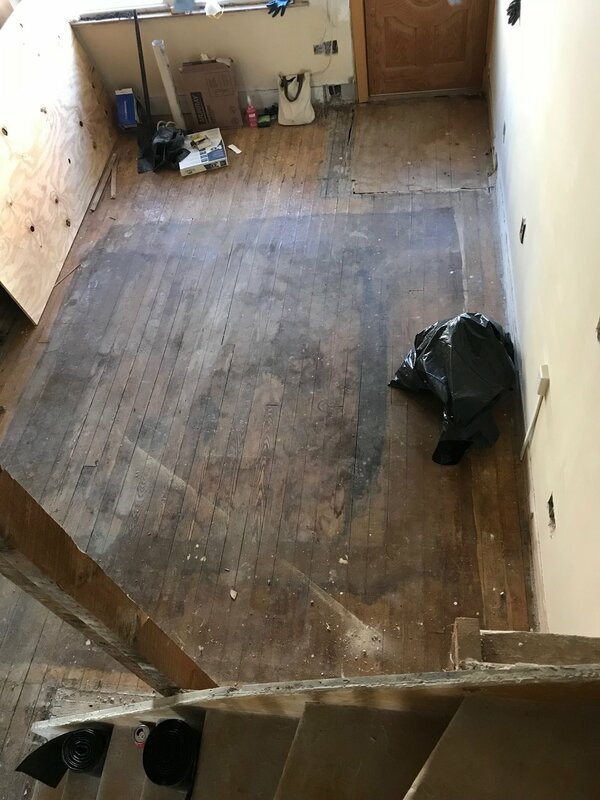 We were able to harvest several boards to be used to patch upstairs but the downstairs will have new wood flooring laid on top of the existing which will act as a subfloor. New Kitchen: This room used to be the dining room, so again, we expected a lot needing to be done in here. Outside of the floors, the main thing in here was opening up what we thought was a fireplace and seeing how wide we could make the doorway to the family room. We found that there wasn’t a fireplace at all, but a chimney and we gained SO MUCH SPACE in here! The opening increased from 28” to 58” which will really make a world of difference once we are in the house and moving through the space! 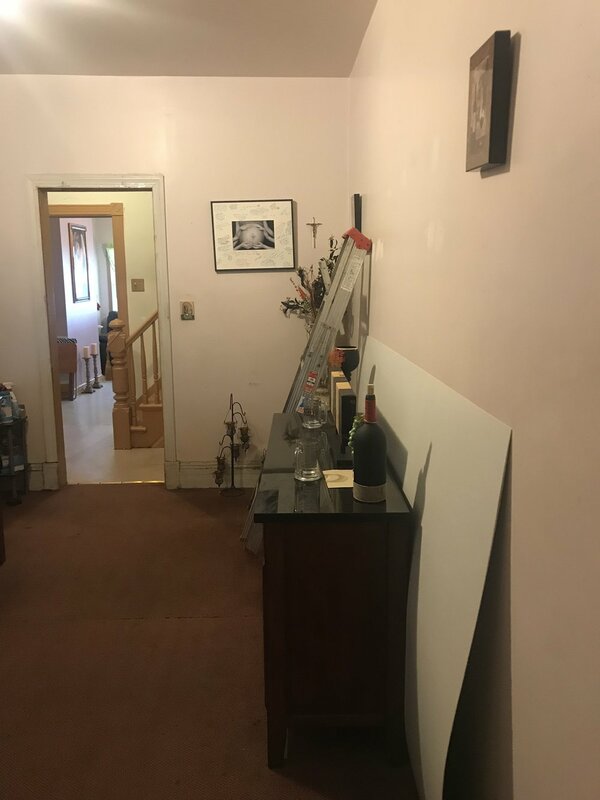 On the other side of the kitchen, We did run into some pipes in the wall that didn’t allow us to gain as much space from the stairway area as we had hoped but we did still get quite a bit more than what was there before so overall it’s a win! Family Room: This room used to be the kitchen so again we expected a lot to change in here. Mainly what I’m most excited for is the addition of the new windows which will be here in a week or so. 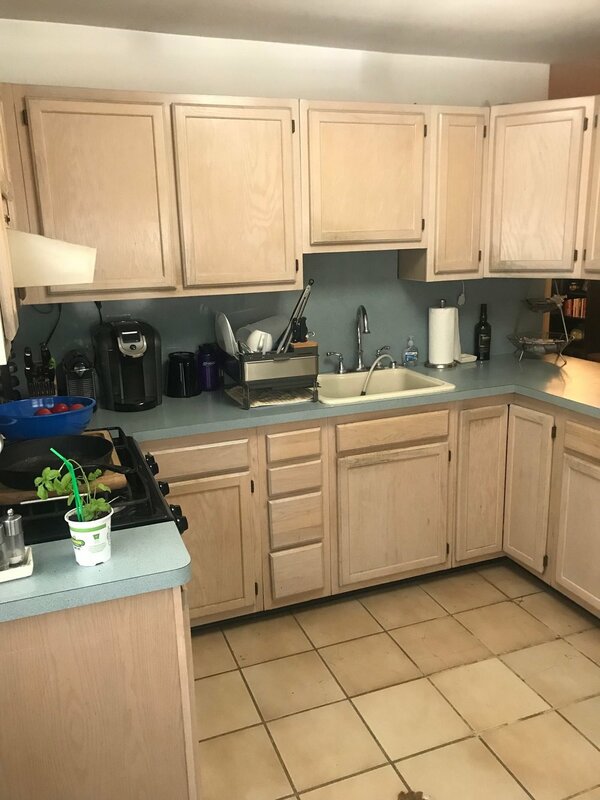 And the old pantry was built into the back corner of this room, removing that saves us so much space here, it’s crazy to see how big this room is without it. Mud Room: This room was full of the most surprises as it was previously a laundry room and we found out we could not keep it as a laundry room. The room itself was originally a deck that was improperly enclosed, and needs to fully be rebuilt. Because of all of the work we are doing right now, we can’t take that on financially so we have made the decision to prep the room to be a laundry room down the road-installing the venting, electric, etc., now and then when we can we will demo the room down to the studs, add support where needed, fill with insulation, sheetrock, tile, etc…. and then we will have a laundry room. We will move in without one, which will be hard, but after living in a condo without a washer dryer in unit and a really gross one in the basement we never used anyway, I think we will be okay for the short term and if anything it will keep a fire under our butts to get it done sooner than later and not push it off for good. Upstairs Hallway: This area is the worst of all the floors, which is a HUGE bummer. 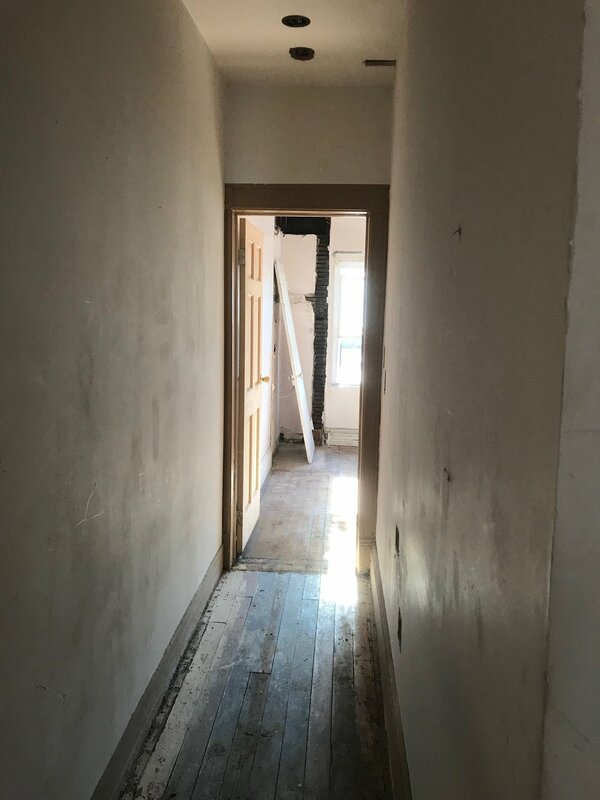 But the good news is that since we were able to harvest wood from the first floor we will be able to completely repair the hallway and other damaged spots on this level and then refinish the upstairs completely so the full second level will be original flooring!! Master Bedroom: After Demo’ing around the chimney in the living room directly below the master we decided to do the same around this chimney to gain back the floorspace in the bedroom. 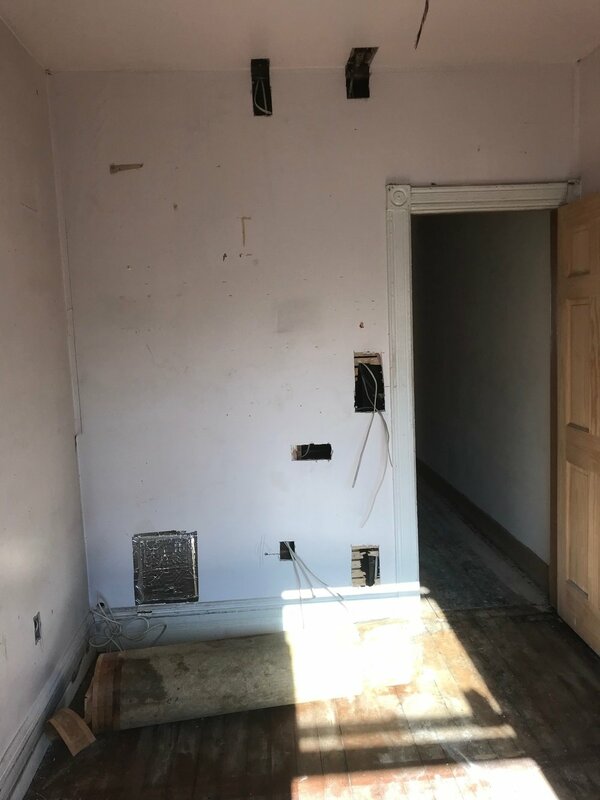 We were surprised to actually find a fireplace here, but ultimately removed the pieces and saved them to clean up and use down the road somewhere else in the house. Eventually we will try to add more storage in here and that will take away from the floor space in the room so it is nice to keep a little bit back from where the fireplace came out. 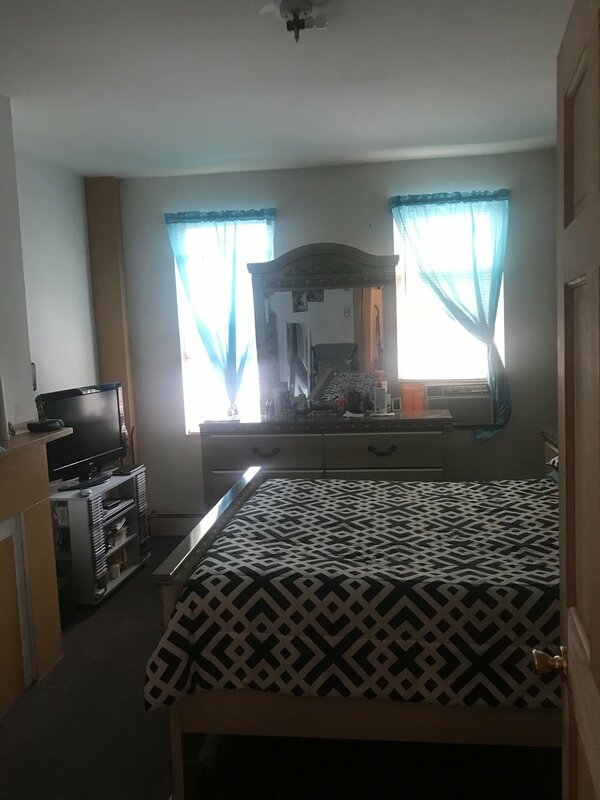 Bedroom 2/Office: This room has the least amount of things happening to it since we are just using it for my office and as a guest room and we are trying to stretch our budget so all that will happen in here are floors and paint. Fortunately no big surprises here, just a few rough spots on the floor that will need to be patched. Bedroom 3/Eleanor’s Room: This room had the best floors of them all!! And taking out the huge corner closet, again opens up the room so much! But taking out the closet in here also revealed a huge gap to the outside right below the roofline that was likely caused by critters. (Is your skin crawling, because mine is!) That will be closed up asap and fixed both internally and externally. 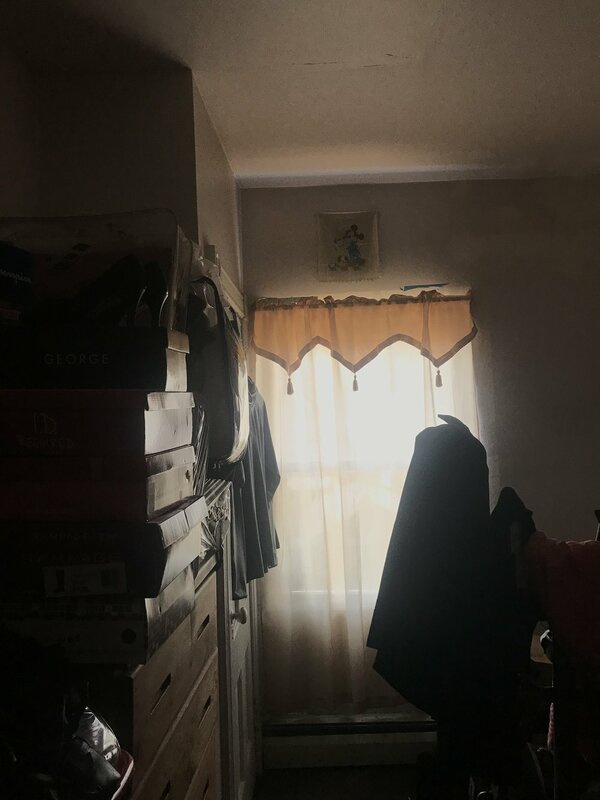 Eleanor’s room is probably one of the most thought out besides the kitchen, just because I’ve been picturing the back wall of her room for ages. We will put back in built-in closets on either side of the window with a bench in between to create a really sweet little space in here for her. I’m only a little jealous that this room isn’t mine. Backyard/Back of house: If you’ve seen anything on what this space looked like the day we closed, you know it has come along way. We couldn’t even walk back here when we bought the house, so the patio area has drastically changed for the better with the pulling of endless weeds. The back of the house itself is waiting for all new windows and siding to come in and then it will get a full makeover. We have also demo’d the old deck and rebuilt the deck, mostly, and will be rebuilding the stairs back here as well. That’s it! A full demo tour! It isn’t pretty, and there were a few surprises, but we are moving forward. Now we just need to get the inspection portion over with so we can start working towards the pretty stuff and, more importantly, moving in!! I hope everyone had a great holiday and enjoyed the long weekend with family! Be sure to pop over to our Facebook, Instagram and Pinterest accounts to follow DBK there. If you follow us on Pinterest you may even have a sneak peek at the inner design inspo for the house! 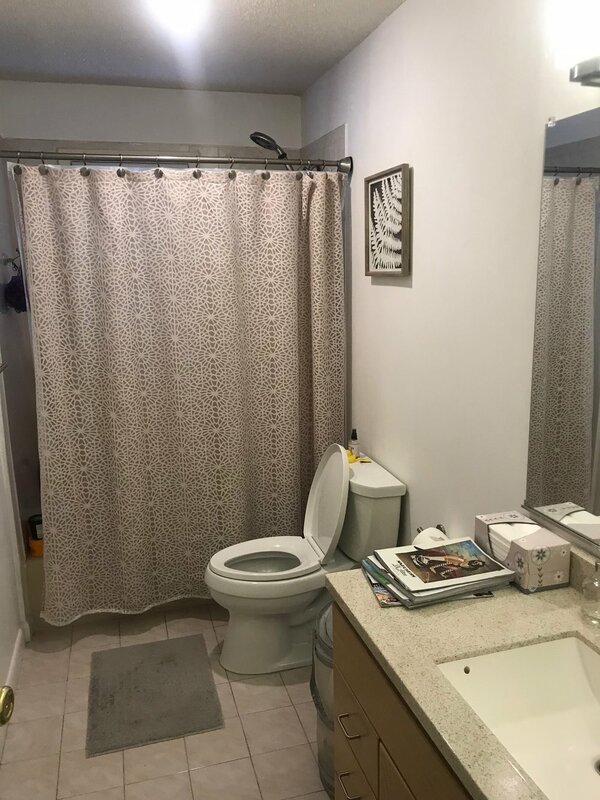 When my client first reached out to me for this space, the bathroom was large but inefficiently used, especially for their needs. 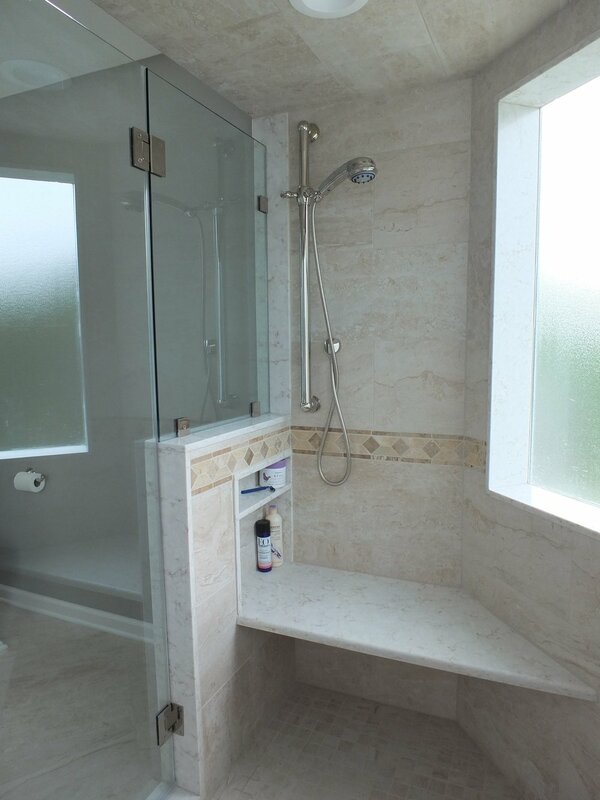 We decided on a layout to maximize the space and give them the dream shower they had been pining for. Those large bay windows mentioned above used to surround a garden tub that really didn’t get a lot of use. 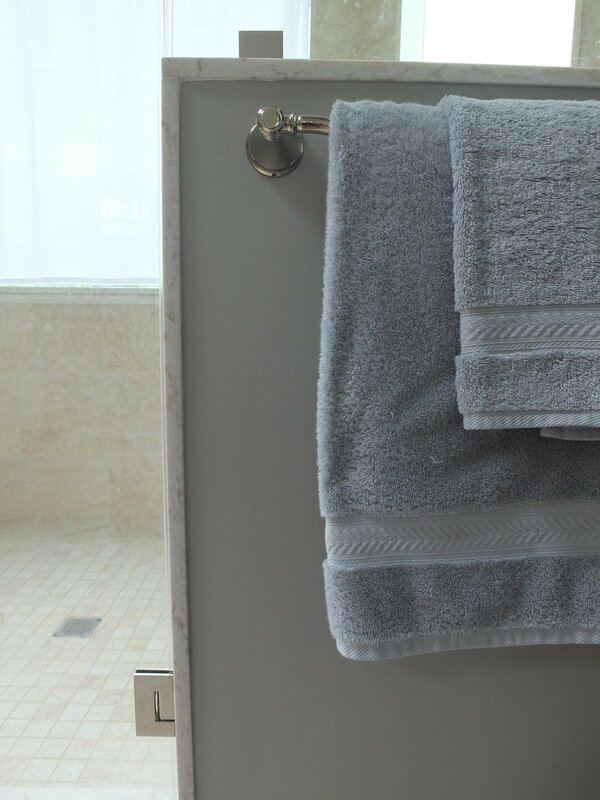 The shower was the size of a linen closet, and the cabinetry in this master bath was a small single vanity and a tall linen cabinet. 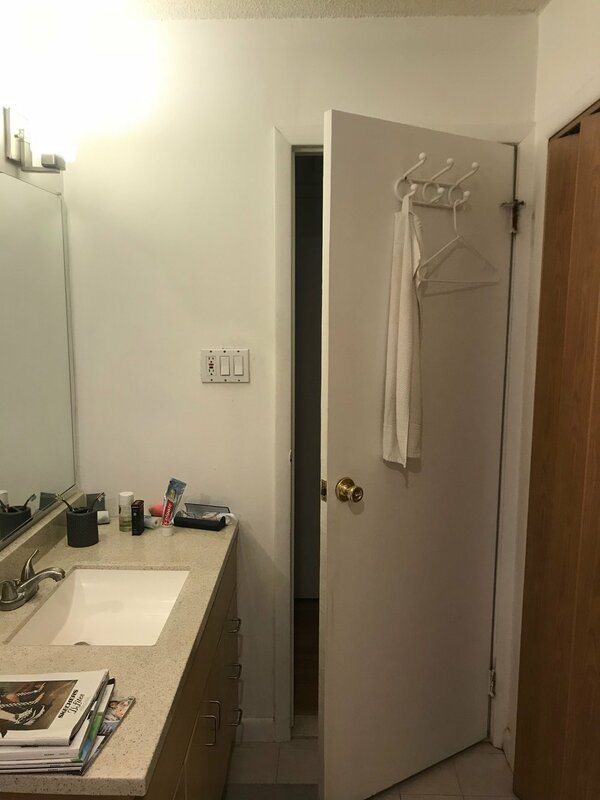 We changed the location of the entrance to the bathroom and turned the small shower into a linen closet right outside the door. 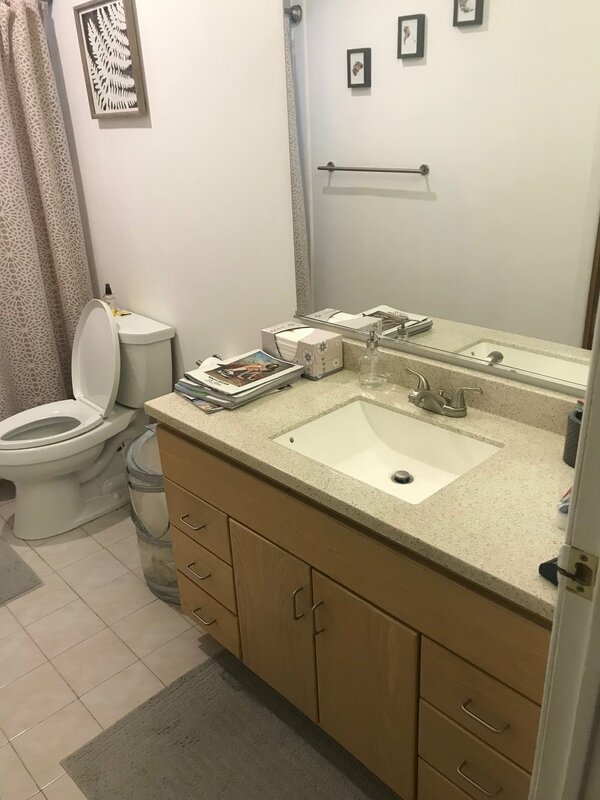 We took out the cabinetry and made space for a large double vanity to give “yours and mine” zones, appropriate for a master suite. We took out that massive built in tub and replaced it with an even larger shower! 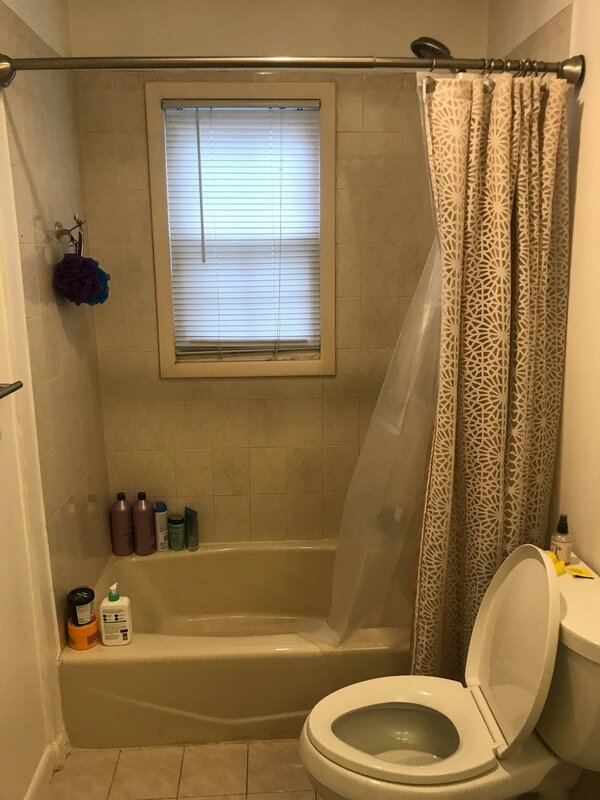 For privacy, we slightly shortened the windows, frosted some of the glass and placed a small custom shower curtain in the center window for added privacy when needed. Visually, we replaced all the tile, finishes and accessories throughout the space to complete the look! What do you think? 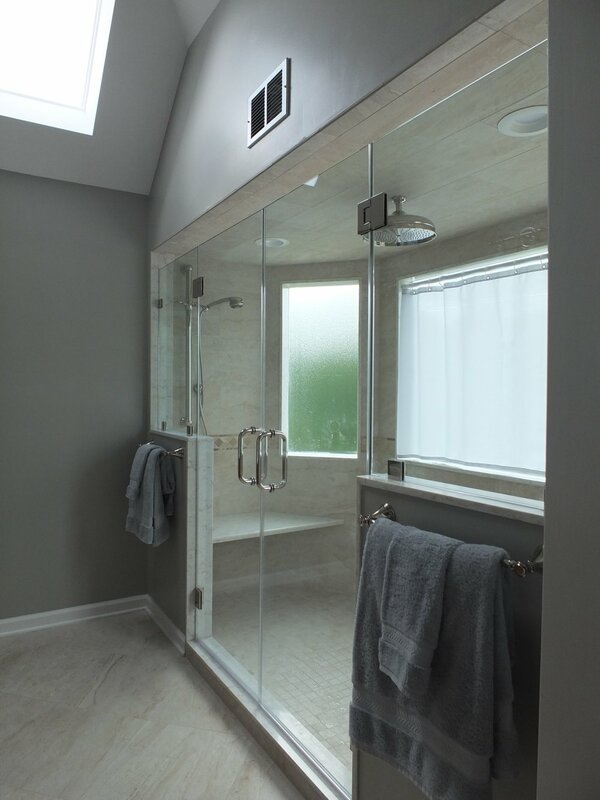 Would you be thankful for a master bath like this in your home? I hope you all have a happy and healthy Thanksgiving holiday! See behind the scenes pics from Project Bae on Instagram and follow us there for more updates! The sugar box had been on the market for a while before we saw it. It had actually been re-listed with a new agent who held an open house to gain some attention. I had plans that day and took Eleanor with me, but Pat decided to go take a look before work because it fell within our budget, it had our bedroom and bathroom requirements met, and since there were no pictures, he was intrigued. 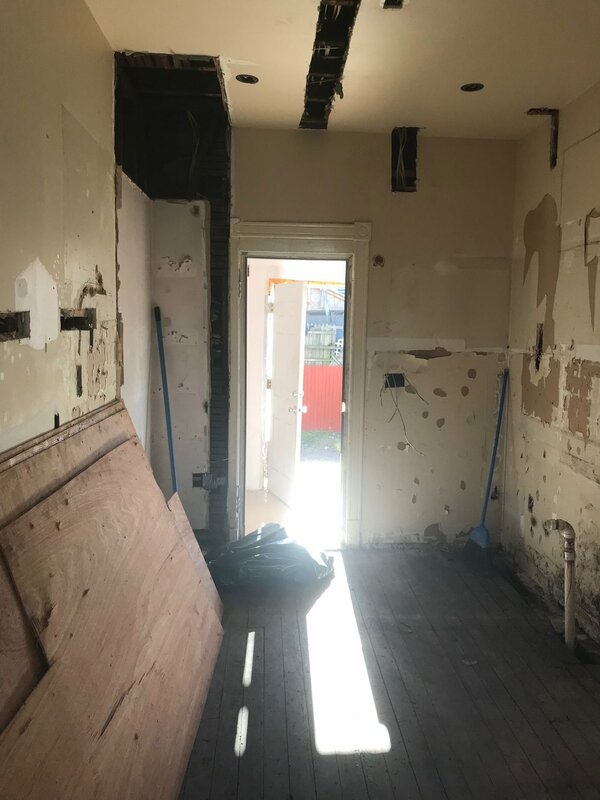 We all know that no pictures is typically a sign that a house needs work, but to be honest, the interior designer in me had been pushing for a home that needed a little renovating anyway… something in need of a little work that I could put my own spin on. He called me from the house and then FaceTimed with me to show me around. I remember the service being bad, the video quality being grainy and not really sensing much more than that Pat liked it enough that he wanted to bring me back to see it. 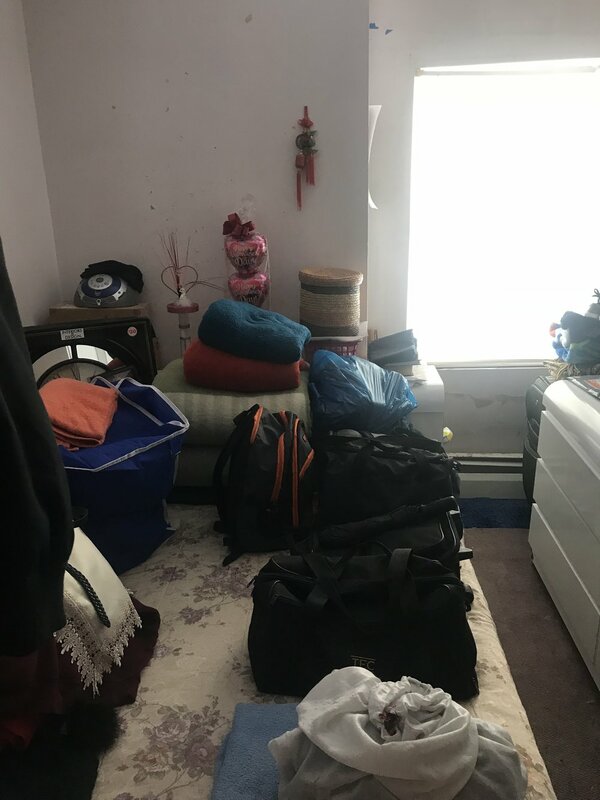 So that’s what we did.. We scheduled a showing for the coming week, and I wanted to share with you all what we saw… the woman living in the house had been there for over 30 years, and she had all of the belongings and memories to show for it. To be honest, I really wasn’t sure it was a good fit at first. I know our area of Jersey City well and didn’t really know that street. I knew the house had potential but I just felt sort of indifferent about it. 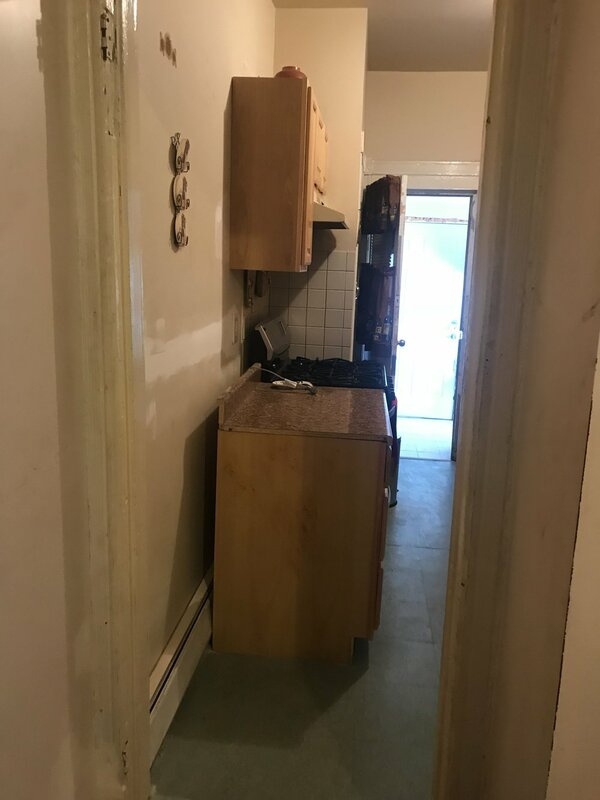 The price was right for renovations, but we had been looking for a while and all the pros and cons of the various places we’d seen were running together. I needed something to grab me about a place… something to make me see and trust it was right. Well, I had a dream in the days that followed our showing. 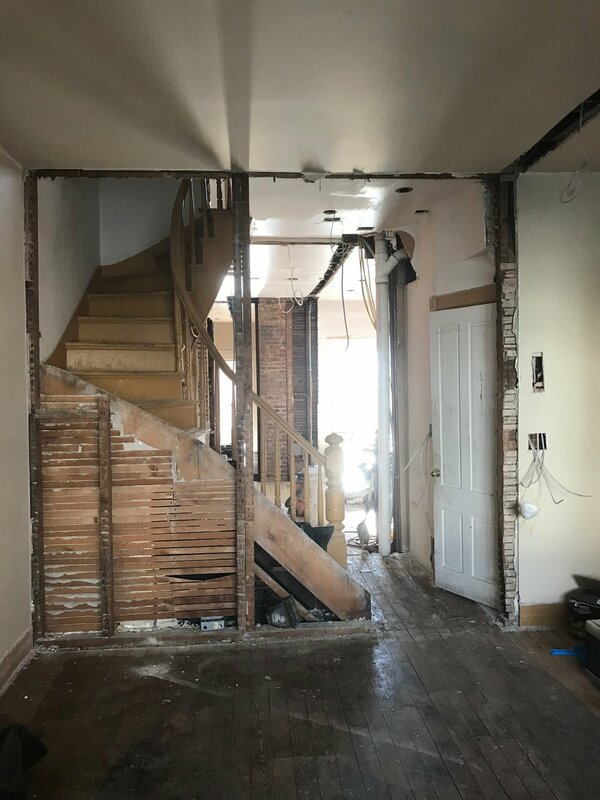 It was from the viewpoint of the front door, and the wall of the stairs had been removed. It was Christmas, and Brantley and Eleanor were coming down the stairs, with so much joy and excitement (yes dogs and toddlers can be equally excited about the holidays! )… I woke up with a start and knew that was it. Christmas is one of my favorite holidays, and envisioning our family there in that old row house during such a special time, as cliche as it sounds, was all I needed. Fast forward 6 months and the house is ours, construction is underway and that stairway wall is coming down. We will be moved in soon enough, and I can’t wait to have our first holiday at home together. If you’ve been following along on Instagram with #PsSugarBox you are likely all caught up. 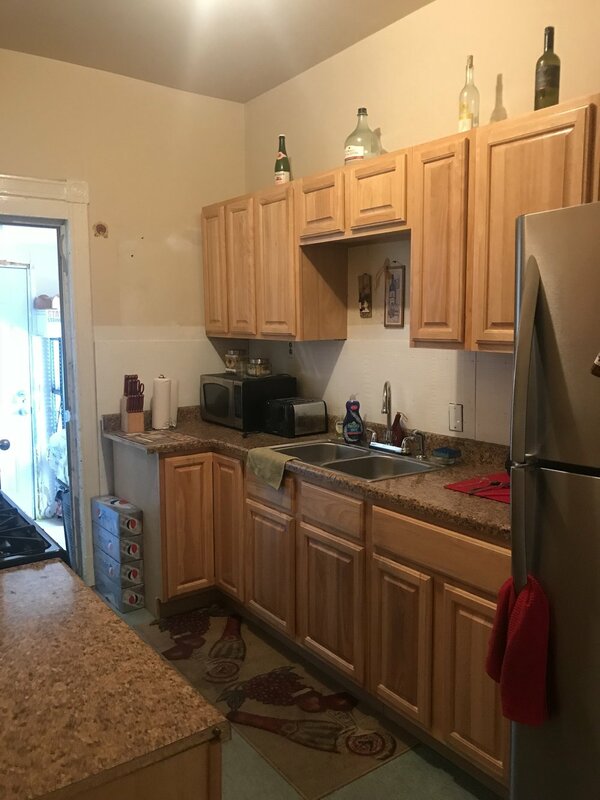 I’ve been doing a walkthrough of the property once a week sharing progress and set-backs. Next week I will try to blog the demo progress, and then soon-after (once things are finalized) I will share our design plans for the whole home! Thank you for following along on our adventure! It has been almost a month since we sold our condo and I wanted to bring the blog back to share some of the journey with you. 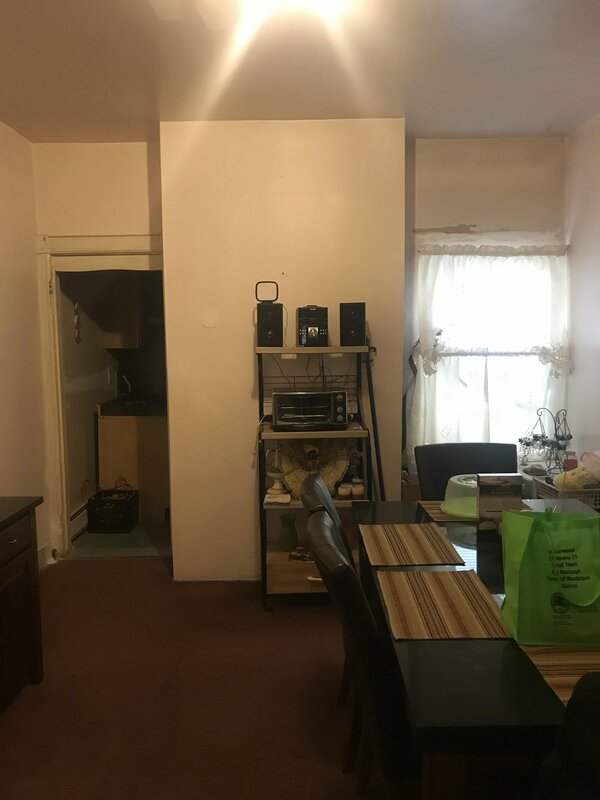 When we bought the condo, it looked completely different. We DIY’d that baby to perfection (our lived in version anyway) starting on day one! The first thing we did once we closed on the condo almost five years ago was start ripping out the wall-to-wall carpet in the bedroom. Over the course of those years and a few One Room Challenge’s to encourage us to get it done, we put our own spin on every nook and throughout each room. In addition to updating the rooms, we upgraded our family. Brantley came home with us when we had only been there a few months. We planned our wedding and honeymoon from the living room over many late nights. And we brought home our sweet little Eleanor there too. It was our first home as husband and wife, the first place we owned and could put our spin on, and our first place as a family. The upgrades we made were many, we added storage and optimized the existing storage to max out the little space we had. 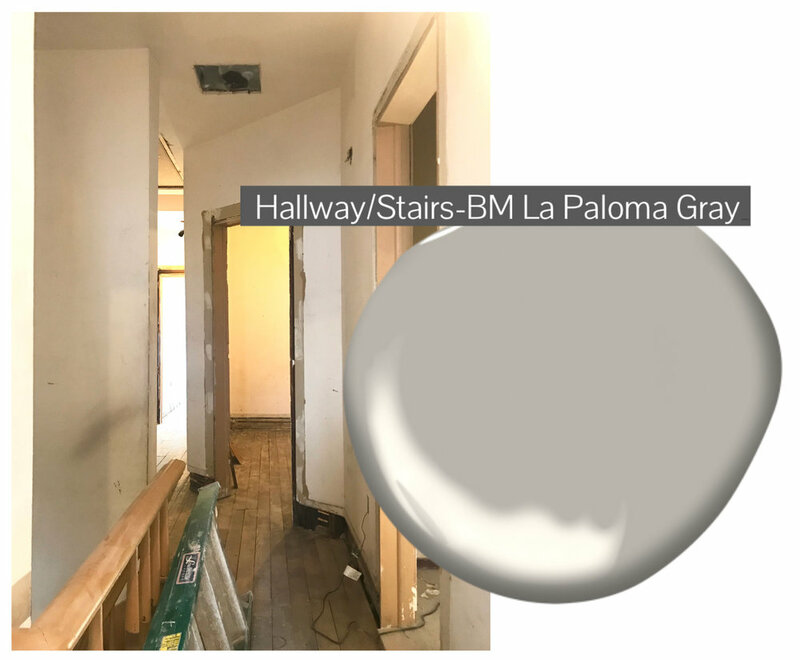 We painted every wall (at least once), refinished every floor-board, replaced all the light fixtures (except the bathroom, that sad light never got updated!). 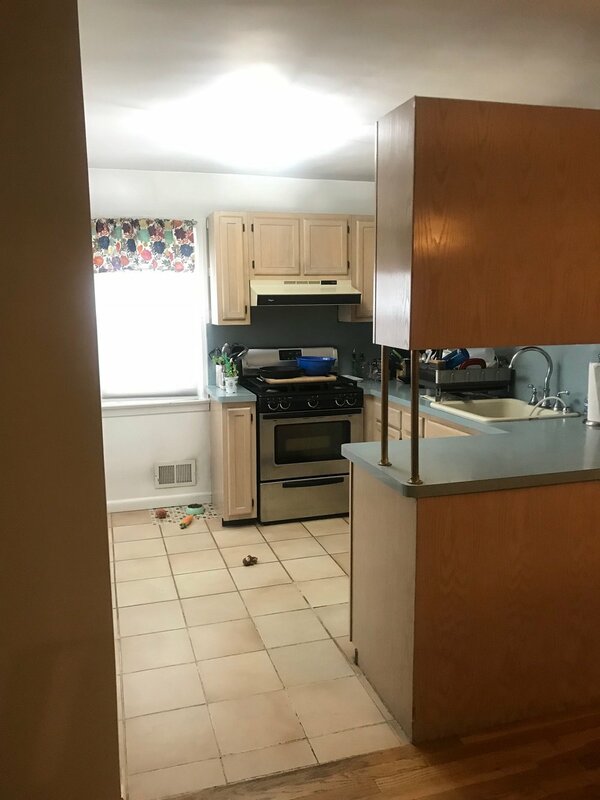 We updated the kitchen, painted the cabinets, added custom window treatments to in a few of the rooms, accessorized as we lived, decorated with things we loved, and we grew so much within that space that was home. Everything we did there truly paid off when we got an offer within the first week on the market. The little things you do make a big difference in your daily life but they also will pay off in the end. The big things you do will have an even larger affect and I’m so glad we did them while we were living in the condo so that we could enjoy the changes we made every day! 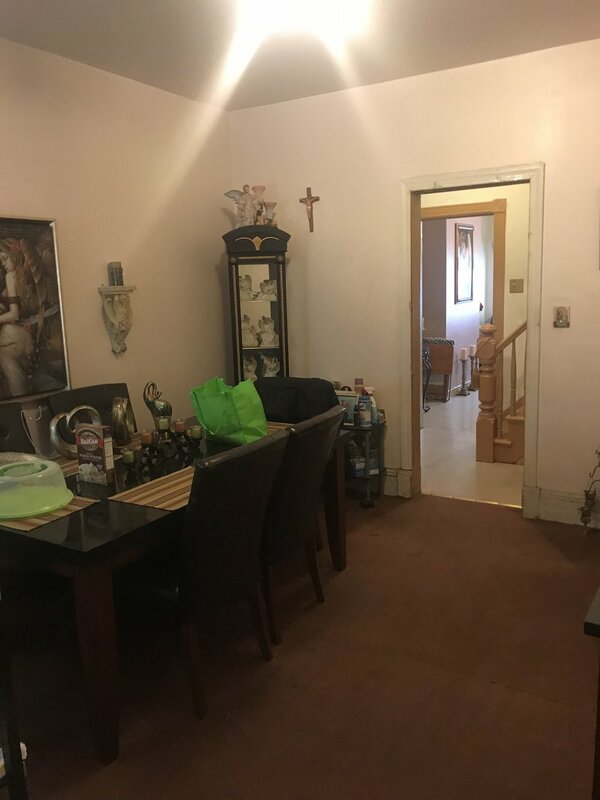 We did decide to leave all the light fixtures behind, and although the chandelier in the living room made me smile every time I came home, we bought it for that space and I trust the new people will enjoy it just as much! 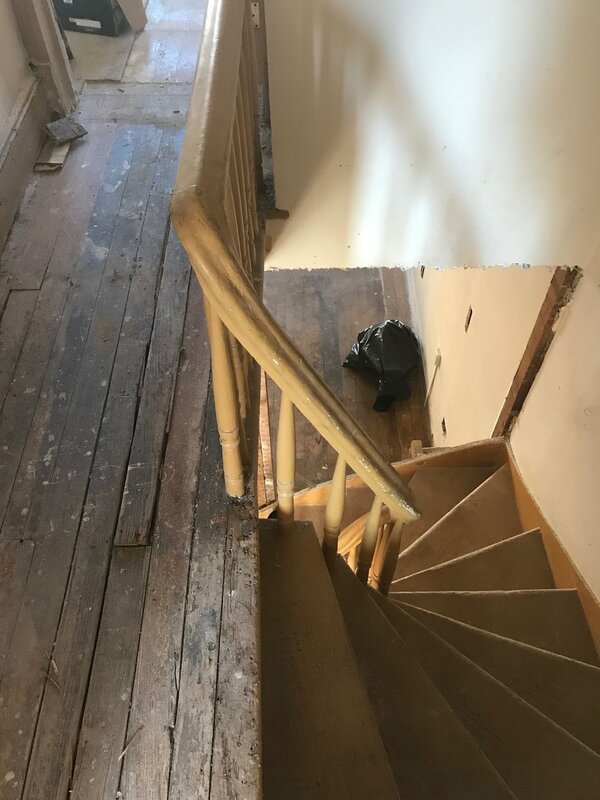 Our next step from here is buying our new home, a centuries old row house that needs more than a little TLC, and we couldn’t be more excited to be embarking on the challenge. More on that in the next post! 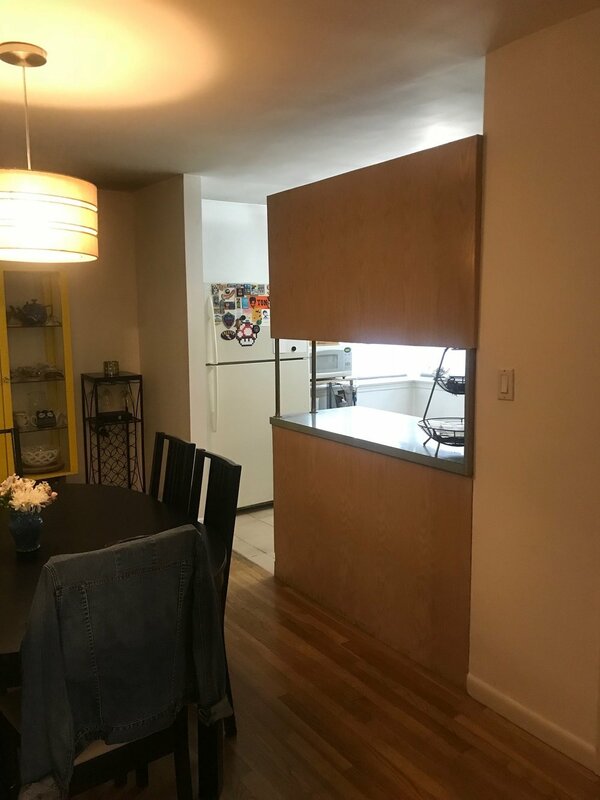 You can see more pictures of the condo here, and you can follow along on Facebook and Instagram for more regular updates! Welcome to DBK Home! This has been a long time coming and I hope you like what you see here. I have been working through this rebranding phase for what seems like an endless period of time! For those of you who I've worked with for a while or who may have followed me on social media, you may know me as Designed By Krystle... and often I refer to my company as DBK in the shorthand. Over the years I have been trying to create a more streamlined and cohesive brand for my design biz so that you could type in the name and find us anywhere... of course it's not always that simple, so here are links to our social media: Instagram, Facebook, Twitter, Houzz. I chose DBK home because your home is what we are creating when we work together. Not just the place you wake up in and come back to at the end of each day; but a place that you long to spend time in, to create memories in, to grow in. And I hope that the feelings of home are felt through this new brand launch, this new website and all that comes with it. I'm so excited for this change and the beginning of this new season both for the business and for myself. I think this process has helped me grow as a business woman and a designer. It has challenged me to create this space and I hope to be able to continue to build from here with newly finished projects as well as to share some of the behind the scenes details and whatever else is in the works right here on this blog! I have made the decision to keep the OG blog live and running so you can always reference back there for the archives, but this will start us off fresh and I hope you will continue to follow along. Feel free to leave a comment, I would love to hear from you all and read your thoughts on this rebranding launch, the new site or whatever else you want to share! HUGE shout out to my hubs for not only being my main sounding board through this process, but for helping carve out space to build this new brand. More thanks to all of my other dear friends and family who have also been sounding boards throughout various parts of this process; and to my girl Denise for helping me get started with my new logo, her creativity and understanding of how to visualize my thought process are amazing and appreciated beyond words. Thanks to all of you for your continued support on this journey!